On September 5th, the US Embassy declared Tokyo “a dengue fever zone” and urged Americans staying in Japan to take precautions as the number of those infected within the country passed fifty. There has not been an outbreak of dengue fever in Japan since 1945. The Tokyo Metropolitan government, after finding mosquitoes carrying the disease in Yoyogi Park, closed down the facilities and is spraying the area with insecticide. The park appears to be the epicenter of the outbreak but the government is also investigating possible infections originating from neighboring prefecture Kanagawa and other parks in the greater Tokyo area. Shinjuku Chuo Park has been designated another hot-spot. Meanwhile, reports of the problem and images of men in Hazmat suits spraying the park are dominating Japan’s evening news but no one is sure how the outbreak began or if it can be contained. Dengue fever, while no Ebola, can be fatal in severe cases, and has been the cause of 131 deaths in Malaysia so far this year . 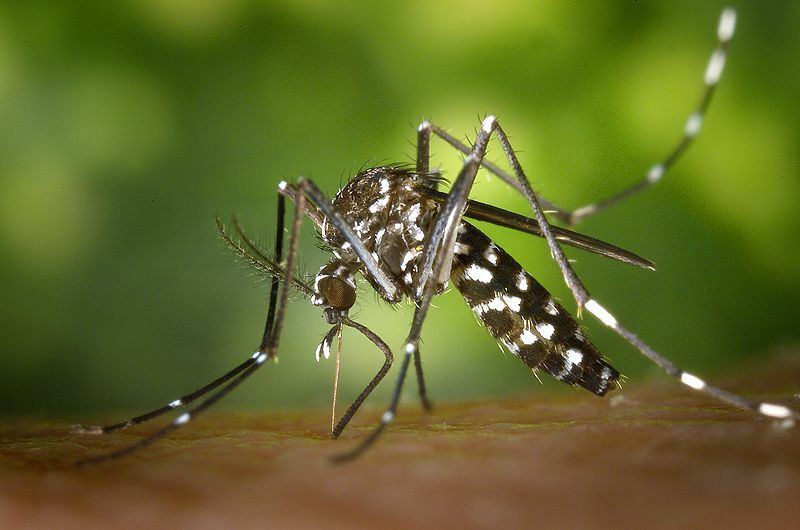 The US Embassy Tokyo in their email warning issued to US citizens in Japan noted, “Dengue fever is a viral illness transmitted by the Aedes aegypti and A. albopictus mosquitoes. These mosquitoes bite during the day, most commonly at dusk and dawn. According to the Center for Disease Control (CDC), symptoms of dengue may include vomiting, high fever, severe headaches, pain behind the eyes, extreme muscle and joint pain, rash, and mild bleeding (mild to severe or easy bruising). There is no specific treatment or vaccine for dengue fever.” People were advised that wearing long sleeved clothing and using insect repellant are ways of avoiding infection. The awareness of the problem began last month when a girl in her teens, who is currently unnamed in Japanese media reports, exhibited a high fever, pain behind the eyes and other symptoms. She, “Patient zero”, was admitted to a hospital outside of Tokyo on August 20th. The mystery: she had never set foot outside of Japan, a country that hasn’t had a dengue outbreak in more than 70 years. Japanese citizens and visitors to the country have caught the disease outside of Japan; last year there were 249 confirmed cases. Dengue, a tropical disease transmitted through mosquito bites, cannot spread from human to human, leading the Japanese Ministry of Health, Labor, and Welfare to concludethat the female must have caught the disease from a mosquito within the country. Patient Zero lives in Saitama, a prefecture that borders northern Tokyo and commutes to a school within Tokyo according to the Ministry of Health. On August 28th the Japanese government announcedthat two classmates of hers, a female and a male both in their twenties, had also contracted the disease. Like the first victim, both of them had never set foot outside of Japan.The three had contracted the disease in Yoyogi Park, a popular and iconic Public Park located within Tokyo. From the beginning of this month until August 20th, the three of them had been practicing a dance routine in the park and had likely been bitten by mosquitos several times. After determining the park was the epicenter of the outbreaks, the Tokyo government began spraying the park with insecticide but has now closed almost all of it to the public.Yoyogi Park is a tourist mecca in Japan, located next to Meiji Shrine, and on the weekends is mobbed with performance artists, bands, and college students. Meiji Shrine has also begun to limit access to the shrine and may possibly be closed down in the weeks to come. As of September 7th, the number of Japanese citizens diagnosed with Dengue Fever who did not contract it overseas has risen to 73, according to the Ministry of Health. While dengue is a disease commonly contracted by those who are in tropical regions, Koichi Morita, the director of the Institute of Tropical Medicine at Nagasaki University, put forth a theory as to why the disease has suddenly shown up in Japan for the first time in years. “A person who got dengue fever abroad likely came to the park, and a mosquito sucked that person’s blood, contracted the disease, and passed it on to another person,” he said in an interview with NHK, Japan’s public television network.While Morita stressed that an investigation would have to be made into which mosquitos can carry the disease, he said that by October the mosquitos will die off and although they will lay eggs, it is highly unlikely that the disease would continue to spread. The number of patients in Japan with dengue fever has been steadily growing over the last few years as more Japanese tourists visit Bali, Vietnam and other countries where the disease is prevalent. These tourists may also be vectors for not only the disease but the insects that carry it. On July 31st, the Asahi Newspaper reported that at Narita Airport and other places, there has also been non-native mosquitoes found that could easily harbor the virus. The Japanese government is concerned that the mosquitoes may be coming back with the travellers or on board the airplanes. A spokesman for the Ministry of Health noted that global warming may have contributed to the outbreak. The Japanese government and US Embassy have noted that there are no fatalities yet and are urging people to remain calm but be vigilant. There is also a bright side to the story, depending on your occupation–mosquitoes are not the only bloodsucking animals in Japan. According to Bloomberg news, shares of insecticide makers surged in trading when the first cases were confirmed and have continued to go up. That’s great news for investment bankers, stock traders and others in the financial community paying attention to the news. There’s a Japanese saying, “The misfortune of others is the taste of honey” but for savvy investors, the taste appears to be a bit more like DEET. Perhaps, the taste of DEET is a bit sweet as well—but only if you also like the taste of misfortune. The original posting of this article was on August 31st, 2014. Japan is in shock over its first outbreak of dengue fever in 70 years, as evidence mounts that the cause is local mosquitoes rather than overseas infections. There is a bright-side to the story, however, according to Bloomberg news, shares of insecticide makers surged in trading yesterday on the Tokyo stock exchange. There’s a Japanese saying, “The misfortune of others is the taste of honey” but for savvy investors, the taste appears to be a bit more like DEET. According to the Ministry of Health, Labor and Welfare earlier this month as girl in her teens, who is currently unnamed in Japanese media reports, exhibited a high fever and other symptoms of dengue. The mystery: she had never set foot outside of Japan, where the disease not been found in decades. Dengue, a tropical disease transmitted through mosquito bites, cannot spread from human to human, leading the Ministry to conclude that the female must have caught the disease from a mosquito within the country. According to the CDC, “dengue virus is a leading cause of illness and death in the tropics and subtropics. As many as 400 million people are infected yearly.” Dengue is rare in the United States; it is endemic in parts of Puerto Rico, Latin America, and South East Asia. The virus can induce Dengue hemorrhagic fever, which at its worst can result in bleeding, circulatory failure, shock, and death. The female, whose exact age was not given, lives in Saitama, a prefecture that borders northern Tokyo and commutes a school within the city, according to the Ministry of Health. On August 20th, she ran a sudden high fever and was immediately admitted to a Saitama hospital. On August 28th the Japanese government announced that two classmates of hers, a female and a male both in their twenties, had also contracted the disease. Like the first victim, both of them had never set foot outside of Japan. According to public broadcaster NHK , the three are believed contracted the disease in Yoyogi Park, a popular public park located within Tokyo. The park is next to Meiji Shrine as well, one of the most popular tourist venues in the city. From the beginning of this month until August 20th, the three of them had been practicing a dance routine in the park and had likely been bitten by mosquitos several times. Over thirty other students had also been present at the practice, but at this moment none of them are exhibiting any symptoms of dengue fever. The park has since been closed off so that any mosquitos in the area can be exterminated with pesticides. A sample of the mosquitos collected show that none of them contain the dengue virus. The images of men in Hazmat suits spraying the park were featured as top news in Japan yesterday and today. The number of patients in Japan with Dengue fever has been steadily growing over the last few years as more Japanese tourists visit Bali, Vietnam and other countries where the disease is prevalent; over 200 were recorded last year. On July 31st, the Asahi Newspaper reported that at Narita Airport and other places, there has also been non-native mosquitoes found that could harbor the virus. The Japanese government is concerned that the mosquitoes may be coming back with the travellers or on board the airplanes. There are also native mosquitoes in Japan that can harbor the virus. If these mosquitoes bit an already infected person, they could easily transmit it to others. The Japanese government is hoping that by October the Dengue carrying mosquitos will die off and although they will lay eggs, that it is unlikely that the disease would spread. This will not be welcome news for those investing in Japanese insecticide makers but maybe next summer, their long-term investments may pay off —if there is another outbreak.